You are here: Home / artist to artist / What Is the Responsibility of Public Art? What Is the Responsibility of Public Art? What is it that distinguishes a truly exceptional work of public art? What does a work of public art owe to its community? As Cambridge Arts Council Executive Director Jason Weeks observes in the Creative Minds Out Loud Podcast, “One of the great hallmarks of public art, besides… that it exists out in the public realm, is it’s done with community interaction.” When that interaction is deep, he says, the projects are more likely to be successful. We wondered about the special considerations of creating art that interacts with a public community – and what makes that interaction successful. We asked artists: What’s the responsibility of public art? Public art, when done well, becomes a talisman for place. It can celebrate who we are now or provide witness of what has come before. In some cases public art can also glimmer and make evident new ideas that have not been collectively held or individually considered. At best public art is an offering for those who never imagined that it could exist, even for those who are now young or not yet here, so they too can discover and feel a changed awareness and possibility. So many examples exist! Maya Lin’s Vietnam Veterans Memorial, Kapoor’s Cloud Gate/Chicago Bean, contemporary Echelmans, older Calders… and so many more recent works that mark place and address the times we live in! In the best forms, the purpose of public art is to mark and commence in ways that nothing else can. It is born from a heartfelt need of a community or committed individuals and then forged by the vision and talent of an artist or artists. Made in temporary or permanent gestures, working at a large or small scale, the function of public art goes beyond decoration or adornment. It instead anchors a physical location and provides unique experience to those who freely encounter the work. Public art brings people together to consider themselves beyond themselves. This ballast is essential, especially in these times of increasing alienation and dislocation. Public art should express community values, enhance our environment and in some cases transform the landscape. Public art can be a form of collective expression, either by involving the community directly in its design and execution, or simply by issuing the parameters in a call to artists. Thus, the responsibility of public art is to reflect, and elevate, the public discourse. Public art can also be a form of public experience where we are inspired, calmed or connected by our surroundings. Public art is evidence of our evolving culture and an expression of our collective narrative that, in time, becomes our collective memory. It is a way to mark our place in history. Public art demonstrates the values of our society and indicates also the value we place on community and communal experiences. Public art adds meaning to our civic life, and is, in essence, an integral part of a fully democratic culture where we share space and time with each other. Public art has the responsibility to matter to its specific community. The way it matters can vary wildly – it can teach or challenge, it can call up a shared history or alter a current landscape. And similarly, the community it engages can be linked in any number of ways – as residents and visitors of a particular neighborhood, as tourists or townies encountering a historically significant site, as individuals with a shared admiration for a key figure such as Bill Russell and Edgar Allan Poe, as commuters whose point-A-to-point-B journeys are surprised with an undulating sculpture or a revitalized urban wall. You might say “matter to its community” is a low bar, and maybe it is, but the most exciting public art matters deeply to the community it intentionally and knowingly means to reach. Laura Baring-Gould is a sculptor/visual artist who has twice received Mass Cultural Council Artist Fellowships and was among the presenters at the recent Mass Cultural Council Institute. 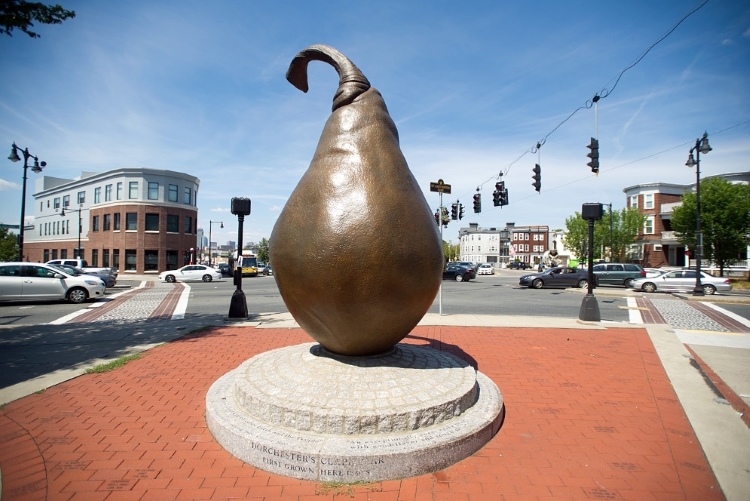 Known for her gallery and museum-based installations, Baring-Gould has also created a series of site-specific temporary and permanent public artworks including Boston’s Dorchester Clapp Pear. Current projects include a NEFA Creative City grant project exploring land use and sustainable agriculture in Boston’s Dudley Square neighborhood which will take place in the summer of 2018. Nora Valdez is a sculptor and public artist whose work has been exhibited and acquired by many institutions, including, most recently, the collection at the Southern New Hampshire University. She will be an Artist in Residence in Salisbury University in Maryland starting in April and at the Eliot School in Jamaica Plan in August. In July, she will be in Vermont at The Carving Studio and Sculpture Center in West Rutland directing The Bench Project in its 10th year. 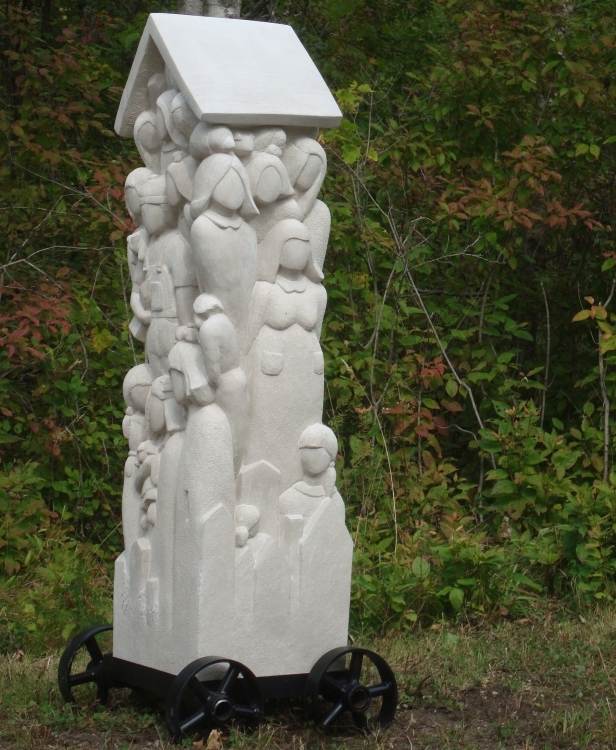 Images: Laura Baring-Gould, CLAPP PEAR/DORCHESTER HISTORY (2005-2011); Nora Valdez, INSIDE HOME (2014), Indiana limestone, 72×24.5×24 in.